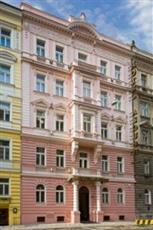 The Alqush Hotel Prague is located within 10 minutes walking distance to the Wenceslas Square and I.P. Pavlova subway station. Comfortable and cosy, each of the 24 modern guestrooms are spacious and comes equipped with all the contemporary amenities to provide guests with a good night's sleep. Enjoy dining at the on-site restaurant that serves mouth-watering cuisines of national and international flavour for you to delight in. Guests can also savour fine drinks at the bar as you unwind after a long day of work or pleasure.